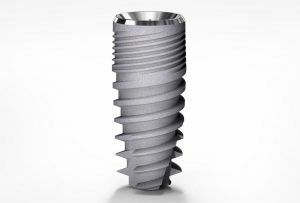 It is a replacement tooth root, which is placed into the bone of the jaw to hold a prosthetic restoration (crown, bridge, or denture). It is made of titanium, a metal which osseo-integrated perfectly in the bone jaw. 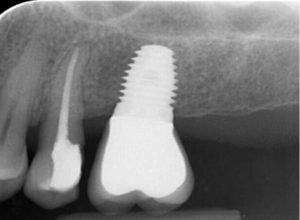 Despite the fact that implants have very high success rates, in some cases osseo-integration fails (early complication) or peri-implant disease occurs (late complication). This disease resembles periodontal disease. Dental plaque is the main cause of peri-implant disease but factors such as smoking, diabetes, bisphosphonates, or history of periodontitis play a crucial role, as well. 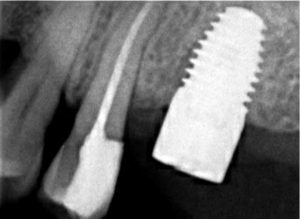 Do we place implants in periodontitis patients? An implant is one of the best ways to replace missing teeth, which have been lost due to periodontitis. In some cases, it is the only treatment choice for fixed prosthesis, in the posterior sites of the mouth. Furthermore, research evidence indicates that in periodontitis patients longitudinal bone loss at implants (peri-implantitis) is positively correlated with periodontal disease susceptibility. When do we place implants in periodontitis patients? Periodontal therapy (initial and/or surgical) must be completed before implant placement. Periodontal health is a prerequisite for successful implant placement and osseointegration. Apart from that, high level of oral hygiene, acquired during periodontal treatment, helps patients to maintain clean and healthy implant prostheses. What is involved in getting an implant? First the implant is placed into the bone of the missing tooth. As the jawbone heals, it grows around the implant, anchoring it in the bone. This healing process takes at least 2 months before the general dentist/prosthodontist continues with the screw – or the cement – retained implant superstructure. Implants also must be committed to good daily oral hygiene. Implant patients should be also evaluated at regular intervals to monitor their peri-implant status and the condition of the implant supported prostheses.